We are proud to offer the latest generation premium minimally-invasive laser refractive surgery procedure for patients with nearsightedness and astigmatism, VisuMax ReLEx SMILE (Small Incision Lenticule Extraction). This is a flapless, bladeless form of laser eye surgery which effectively turns laser eye surgery into a keyhole or pocket procedure. Patients with very high prescriptions, drier eyes, contact lens intolerance and/or thinner corneas may now be qualified for surgery. Laser refractive surgery procedures using the Excimer Laser such as PRK (Photorefractive Keratectomy) and LASIK (Laser Assisted in-situ Keratomileusis) and have been successfully performed on several millions of patients over the past two decades around the world. These procedures are very effective in restoring spectacle-free clear vision with a few associated issues such as delayed visual recovery and discomfort in PRK and corneal flap complications in LASIK. 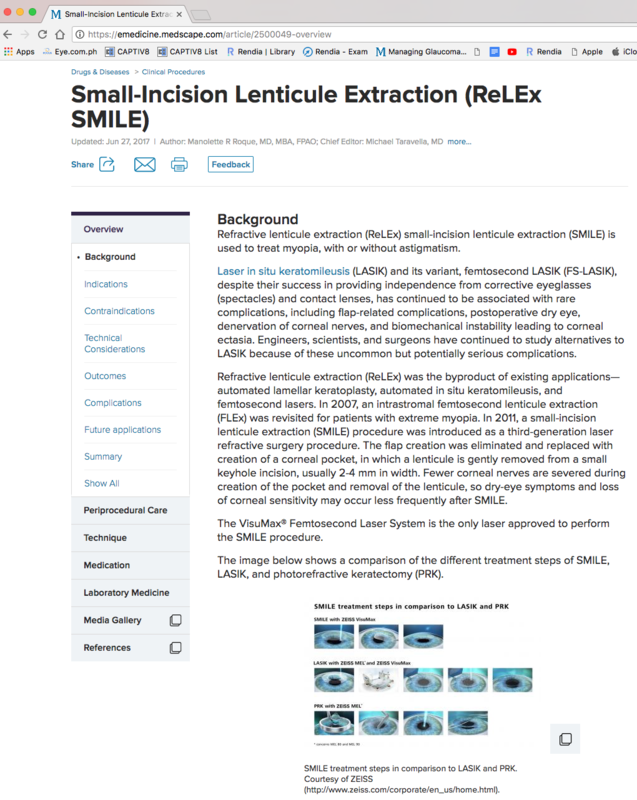 Refractive Lenticule Extraction (ReLEx) in the form of SMILE was developed by Carl Zeiss Meditec to address Excimer issues with the VisuMax Femtosecond laser platform. During the procedure, eye anaesthetic drops are used to completely numb the eye, and the state-of-the-art Carl Zeiss VisuMax laser places a series of pulses in the centre of the cornea with extraordinary 3D placement accuracy. These pulses form bubbles that are less than 1/100th the width of a human hair, and which outline the tissue that needs to be removed to effectively change the shape of the cornea. The laser then creates a tiny connecting tunnel through which the surgeon draws out this tissue. With ReLEx SMILE, no flap is created, so the healing time is faster than conventional LASIK. The procedure takes a matter of minutes, and the vision is 80% better instantly and reaches 100% within a few days. No other laser platform has been able to match the accuracy of the Carl Zeiss VisuMax (which is accurate enough to inscribe a word on a grain of sand) in producing this keyhole type of laser eye surgery. Dr. Manolette Roque published a manuscript on VisuMax ReLEx SMILE at Medscape Emedicine. Click on the image or this link to view the entire manuscript.